The true adventures of David Fairchild, a late-nineteenth-century food explorer who traveled the globe and introduced diverse crops like avocados, mangoes, seedless grapes--and thousands more--to the American plate.In the nineteenth century, American meals were about subsistence, not enjoyment. But as a new century approached, appetites broadened, and David Fairchild, a young botanist with an insatiable lust to explore and experience the world, set out in search of foods that would enrich the American farmer and enchant the American eater.Kale from Croatia, mangoes from India, and hops from Bavaria. Peaches from China, avocados from Chile, and pomegranates from Malta. Fairchild's finds weren't just limited to food: From Egypt he sent back a variety of cotton that revolutionized an industry, and via Japan he introduced the cherry blossom tree, forever brightening America's capital. Along the way, he was arrested, caught diseases, and bargained with island tribes. But his culinary ambition came during a formative era, and through him, America transformed into the most diverse food system ever created. In the late 19th century, eating in America was pretty basic without a lot of variety and probably not a lot of flavor. It was definitely not the culture of being a "foodie" that we have today. Despite the diverse land and climate, especially as the country grew westward, the food that was grown and cultivated, remained relatively the same. David Fairchild, a botanist, with an insatiable desire to travel, sought and brought back some of our favorite foods that we take for granted as always havin In the late 19th century, eating in America was pretty basic without a lot of variety and probably not a lot of flavor. It was definitely not the culture of being a "foodie" that we have today. Despite the diverse land and climate, especially as the country grew westward, the food that was grown and cultivated, remained relatively the same. David Fairchild, a botanist, with an insatiable desire to travel, sought and brought back some of our favorite foods that we take for granted as always having been here. It is amazing to think that foods like avocado, cashews, mangoes, papaya, grapes were not native to America but brought here in the form of seeds or cuttings that sometimes were acquired dubiously and not without danger in some cases. Sometimes with a benefactor/mentor he traveled around the globe several times by ship in order to send back to the Department of Agriculture, seeds or cuttings to be cultivated here in similar climates to their origin. I was fascinated by this particular topic as we take for granted the abundance of different fruits and vegetables that we have access to. There was a lot of interesting historical facts in addition to the adventures of David Fairchild. It is well worth the read if you enjoy reading about the gilded age of American history and something as vital and necessary as the cultivation and propagation of diverse foods. Book DescriptionThe true adventures of David Fairchild, a late-nineteenth-century food explorer who traveled the globe and introduced diverse crops like avocados, mangoes, seedless grapes--and thousands more--to the American plate.My ThoughtsIn the 19th century, preparing meals and eating was solely viewed as necessary for survival. People didn't go on culinary adventures or look for exotic ingredients to create flavor combinations to delight the palate. Enter David Fairchild, a botanist who tra Book DescriptionThe true adventures of David Fairchild, a late-nineteenth-century food explorer who traveled the globe and introduced diverse crops like avocados, mangoes, seedless grapes--and thousands more--to the American plate.My ThoughtsIn the 19th century, preparing meals and eating was solely viewed as necessary for survival. People didn't go on culinary adventures or look for exotic ingredients to create flavor combinations to delight the palate. Enter David Fairchild, a botanist who traveled the globe in search of food items that American farmers could grow that would then provide more choices to the American eater.Daniel Stone has written an incredibly detailed and insightful book based on David Fairchild's journeys. Love kale, mangos, avocados, pomegranates and hundreds of other crops? You can thank Mr. Fairchild. Mr. Stone used Mr.Fairchild's extensive notes to bring his journeys in the 19th and 20th centuries to life. World travel was much more complex than what we are used to today and David had many epic adventures. In addition, he had to fight our government's reluctance to bring non-native plants to America. There are so many interesting stories about the foods we as a country were eating and how Fairchild was so instrumental in shaping our culinary canvas.I read this from beginning to end in one book binge. As someone who considers herself a foodie, I am amazed that I wasn't familiar with all that David Fairchild accomplished. I highly recommend this book to anyone interested in food. It was enlightening and enjoyable.Thank you, Daniel Stone, Penguin Group Dutton, and NetGalley for the digital ARC. Winning a contest is always good, but winning an outstanding book is even better. “We have only one life to live and we want to spend it enriching our own country with the plants of the world which produce good things to eat and to look at. "This is the next pick for my local bookclub and even though I had to fight the eBook hold lists at the library, I was able to get to it before we meet. It is a fascinating tale of many of the foods grown and consumed in America today, all because of this one man who ventured out and collected seeds and cuttings from around the world. My un “We have only one life to live and we want to spend it enriching our own country with the plants of the world which produce good things to eat and to look at. "This is the next pick for my local bookclub and even though I had to fight the eBook hold lists at the library, I was able to get to it before we meet. It is a fascinating tale of many of the foods grown and consumed in America today, all because of this one man who ventured out and collected seeds and cuttings from around the world. My unfortunate husband got to hear a lot of tiny bits that I found fascinating. I'm looking forward to our discussion, especially since many of the people in the book club went to a talk with the author.What about how he tried breaking quinoa to the states but people didn't get it, and it took ten decades for it to get popular? My favorite place is probably where Fairchild talks about kale as the food of the common people and the author puts his own digs. I love kale! One of the best food history books I have read. Be prepared - it is long and there is a lot of background information on Fairchild here. But once you finish, you will never look at Meyer lemon, the cherry blossoms in Washington DC, or avocados the same again! So rich in detail! Truly brings these people to life. Just about every time you eat a fruit, vegetable or just something exciting that came from the earth, not was killed for you or by you, you have David Fairchild to thank. And no one even knows about him or at least not enough and I’m so glad there’s now this book to educate and finally give credit where credit’s due. For any discriminate palate, every vegetarian, anyone who likes or loves food, David Fairchild is The Man. Tirelessly traveling the globe and collecting fruits and vegetables (and t Just about every time you eat a fruit, vegetable or just something exciting that came from the earth, not was killed for you or by you, you have David Fairchild to thank. And no one even knows about him or at least not enough and I’m so glad there’s now this book to educate and finally give credit where credit’s due. For any discriminate palate, every vegetarian, anyone who likes or loves food, David Fairchild is The Man. Tirelessly traveling the globe and collecting fruits and vegetables (and these will actually be redefined for you by this book too) and plants to liven, broaden and expand America’s palate. He wasn’t the only one, but he was the initiator, the man with the idea and later a plan, who set it all in motion. Nowadays it wouldn’t work, of course, we’ve discovered much of what is out there to eat, did some food based math…how difficult is it to cultivate/how well will it be liked…and got a variety. But back in the day, late 19th/early 20th century, the market was begging for some diversity. Just like America was built on immigrants (the fact so often conveniently forgotten), American diets were built on and dramatically improved by delicious exports from all over the world. Otherwise it would just be meat and some local crops, how’s that for a fad diet? Nutrition and vitamin depleted blandness permeated kitchens and dining tables across the US and David Fairchild changed it. It’s pretty awesome to think about. Avocados, kale, citruses…so many tasty lovely things, most in fact except for his beloved mangosteen, have become such supermarket essentials it’s difficult to imagine life without them. But there are only here become at one point Fairchild has traveled to the land of their origin, tasted them and brought or shipped them back to the US to be cultivated. Again, awesome. Sure, he’s had some fortunate turns, wealthy improbably named benefactors, propitious marriage (to a daughter of Alexander Graham Bell no less, yes that phone guy), a dedicated protégé (Frank Meyer, more on him later), but what Fairchild was able to accomplish through sheer drive and willpower, the scale of his vision and the work he put into realizing it and his unwavering commitment are simply astounding. USA went through expansion, imperialism, international outreach and then, of course, snapped back into nationalism and xenophobia (like it does), but Fairchild always persevered in his belief that new and exciting things from other countries can only be good for the society. Sure it’s just food, but it’s a pretty poignant worldview for this day and age. What he’s done was quite heroic and I’m glad to have learned his story. Now Frank Meyer was a Dutchman who came to the US and picked up Fairchild’s outbound missions as the back stayed back in Washington to manage the operations. Oh and you know all those lovely cherry blossoms Washington D.C. is known for…Fairchild to thank and a great story. There was quite a serious battle of wills between Fairchild and a former childhood friend now formidable foe who protested further imports citing the dangers to existing crops. Food export and cultivation was a complicated process back in the day, but also a huge industry, consider the fact that almost 50% of the population were farmers comparing to only a few % today. Where Fairchild was devoted, Meyer was a fanatic, he traveled China extensively and (stunningly) a lot of it on foot and eventually the dangers (local war and crime), the privation, the disappointment in the world (this s around WWI) and (probably most crucially) the loneliness and isolation proved too much for him. That was probably the most emotionally devastating part of the book, reading about Meyer’s descent into depression and Fairchild unable to help, not unwilling, but through a difference of mentalities and restricted by the prevalent spirit of get up get going, unable to write the right things in his letters. Meyer is the man behind Meyer’s lemons. There is a joke here somewhere about lemons and lemonade, but none that would be in good taste. The man’s trajectory was a tragic one. Fairchild had more food collectors, but none like that. And eventually the need for it died out, the devastation of The Great War reduced the demand for exotic foods. It boggles the mind to consider the variety, though…once there were something like 409 varieties of tomato being cultivated in the US, now it’s about 79. Boggles the mind to consider that once there was a man who traveled the world trying new foods just to expand the range of what was known. A real explorer. So that’s the book, terrific, absorbing, meticulously researched (seriously about a quarter of it is just dedicated to bibliography and notes), incredibly informative and just very necessary. The version I read was a digital ARC from Dutton, which was challenging…for some reason (copyright paranoia?) all the ff,fi and fl are taken out of the text, imagine the fun, so ist oor is first floor and so on. Different publishers handle ARCs differently, most are perfectly readable, not sure why Dutton chooses to do this to their readers. Also (not sure if it’s because it’s an arc of what) no photos, nothing, just two paltry visual aids. That’s just sad, especially for a book so inclusive. But all that aside, I’m glad to have read it. And you should read it too, it’s only slightly longer than this review. If you did read this entire behemoth of a review though, here are some bon mots from the book to make it worth your while, delight and amuse.To botanist vegetable is any other edible part of the plant that doesn’t contain seeds.In 1893 US Supreme Court ruled tomatoes to be vegetables so they can collect the higher tariffs.4 major original citrus fruits are citrons, pomelos, mandarins and papedas.1893 World’s fair had 2 replicas of Liberty Bell, one made from rolled oats, one from oranges.The word avocado is a derivative of an Aztec word for testicle.Fun, right? The book has tons of these. Thanks Netgalley. Wow. I am not normally a voracious page-turner of non-fiction, but this one did it for me.This is the true story of David Fairchild, a man who was responsible for immeasurably enriching America's agriculture. Does that sound dull? It's not. If you're like me, you love food. If you're like me, you maybe also consider yourself fairly willing to try new things and food of different ethnicities. BUT, none of us can escape that we are probably pretty complacent about the foods we have grown up with, Wow. I am not normally a voracious page-turner of non-fiction, but this one did it for me.This is the true story of David Fairchild, a man who was responsible for immeasurably enriching America's agriculture. Does that sound dull? It's not. If you're like me, you love food. If you're like me, you maybe also consider yourself fairly willing to try new things and food of different ethnicities. BUT, none of us can escape that we are probably pretty complacent about the foods we have grown up with, the foods we assume "belong" to our people and our lifestyle. These foods somehow seem to just naturally have pride of place on our menu, and that's just the way it is, and they're normal, and everything else, while interesting and maybe delicious, is slightly exotic and "outside. "Wrong.When I learned, from this book, how much painstaking work and passion went into importing new plants into America--plants that produce food we now take for granted--I was in awe. When I realized what an absolute lottery of chance it was that certain plants found success in the United States and other plants never quite got a proper opportunity due to accident or poor timing, I was confounded. My exciting, profound takeaway from this book is that there is SO MUCH food out there and given a slight alteration in history or policy, ALL of it could have been MY "normal". If this doesn't change the way you look at food, and enhance your willingness to try all types, then nothing will.This book was extremely well written. Usually when I read non-fiction, I set myself goals of a certain number of pages per time. When I was at about 70% towards the end, I intended to stop for a bit, but I just kept on going. I wanted to know what happened to David Fairchild, to his star explorer Frank Meyer (SO tragic and when I use Meyer lemons from now on I will contemplate his life with the proper gravitas), and to the edge-of-your-seat battle between the plant importers and the pest preventers.This is a tale of a little espionage, a little diplomacy, a little bureaucracy, a little romance, a lot of friendship, and a driving curiosity about the good stuff on the planet. Here are a few choice quotes:"[Fairchild] used to say, 'Never be satisfied with what you know, only with what more you can find out. ""Fairchild liked the idea of espionage, but he was as skilled at covert action as he was at ballroom dancing, having done neither. ""For a botanist, the first taste of a new plant was like meeting a new person, and recalling it flooded the mind with memories of where it had happened, what the tongue expected, and what it found instead." "Wasn't it strange, Fairchild observed, man's propensity to be satisfied with so little when so much was available?" YES, I think so too! "A glass ceiling could be shattered once; after that, latecomers could only break the pieces into smaller and smaller shards. ""His cynicism about people's stubborn tastes had grown strong. "I know there are many people who will shy at the idea of even tasting the leaves of the papaya," Fairchild wrote..."But as they shake their heads they will reach for a cigarette. "***I first learned about this book from a Smithsonian podcast called "Side Door," and NetGalley kindly gave me access to a digital review copy. Absolutely fascinating!I came to this book absolutely clueless about its contents--beyond what's on the cover. A GR friend had added it to her 'want to read' shelf, the cover looked interesting, and my library had it.Once in my hands I dove right in--and barely came up for air until I had finished!There is so much to enjoy here: the author has a deft story-telling style and the story itself is full of action, intrigue, politics, and history. David Fairchild, our hero, left behind a copious archi Absolutely fascinating!I came to this book absolutely clueless about its contents--beyond what's on the cover. A GR friend had added it to her 'want to read' shelf, the cover looked interesting, and my library had it.Once in my hands I dove right in--and barely came up for air until I had finished!There is so much to enjoy here: the author has a deft story-telling style and the story itself is full of action, intrigue, politics, and history. David Fairchild, our hero, left behind a copious archive of written material(field notes, letters, articles) and photographs, so our author had no shortage of source materials. The photographs are especially fascinating.I really don't want to say too much, as I would like readers to have that chance of coming upon something unexpected. However, I will say that Fairchild did his plant exploring in the 1890s and the early 1900s--a time when the US Department of Agriculture was actively looking for new, commercially viable crops for US farmers.I shall now head off to the kitchen to get some red seedless grapes to nibble on--yet one more reason to say 'thank you' to David Fairchild. Reads like fiction and provides incredible insight into where our produce comes from. I’ve got tons of “did you know...” facts that I didn’t even know I wanted to know, thanks to this book.The author reads the audiobook version, making it incredibly engaging for what would seem to be a mundane topic. While this is an intriguing story, I don't know that Stone does it justice with his writing. A wonderful story about the life of David Fairchild a botanist, who traveled the world bring back many new crops and plants for North Americans to enjoy.This story along with all of the fascinating people Fairchild knew, and worked with was exceptionally fun to read. So much information, not only about plants but of the people as well, who against many odds brought these plants to North America. How to ship, pack and eventually grow and get people to like what they grew was a constant challenge, A wonderful story about the life of David Fairchild a botanist, who traveled the world bring back many new crops and plants for North Americans to enjoy.This story along with all of the fascinating people Fairchild knew, and worked with was exceptionally fun to read. So much information, not only about plants but of the people as well, who against many odds brought these plants to North America. How to ship, pack and eventually grow and get people to like what they grew was a constant challenge, and just the effort to keep their findings alive for the long journeys back home was fascinating. Today I must say we take what we eat and how simple it is to pick it up at the store for granted. Once you know the challenges the early botanist went through so that we can have this luxury, is quite eye opening.There are so many facts to read about, some of the people were quite eccentric, such as the Dutch agricultural explorer, Frank Meyer (The Meyer Lemon) who was sent by the US Dept of agriculture to Asia many times to search out new plants. He loved plants but he also loved just wandering and was quite often in the midst of real danger.Fairfields long time mentor, Barbour Lathrop an American philanthropist and world traveler, Would cover Fairchilds expenses if he would travel with him around the world. This would benefit both of them, the company and the chance to look for plants as Fairchild himself did not have the money, and who at an early age didn't feel he could sit behind a desk for work. Later on he would marry Marian, daughter of Alexander Graham Bell.This book has a lot of photos I understand, but which I did not see as I received an advanced copy of the book from NetGalley and Penguin Group Dutton, Thank you. *3.5. Tons of interesting information and mostly well-written, just dragged a little in some parts. I learned so much though, this book is an education in and of itself. An excellent story of how so much of our food came to be accessible to us - through the dedication of several men committed to exploring the diverse world of plants. I really enjoyed this, especially toward the end. How lucky we are for David Fairchild and his colleagues! I was looking forward to this book for months, but just didn't end up loving Stone's writing style or his audiobook narration. I also think I was hoping for more about the early Columbian Exchange, because it seemed like half the time a new fruit was discussed, it was like "well, this was technically already growing in the US, but Fairchild introduced a hardier, more popular variety." I might have liked it more if I went into it without any expectations. "Voices as pointed as their hats"??? What does that even mean?Who founded the Red Cross? - it wasn't Clara Barton.People in Australia celebrate with pies, curry and lamb chops? ?In 1897 Australia wasn't federated so there was no Australian Department of Agriculture. I assume he meant New South Wales. "Developing governments, especially those, like Australia, endowed with money from a foreign crown..." What? What money from a foreign crown? In 1897 NSW and the other colonies were self governing and "Voices as pointed as their hats"??? What does that even mean?Who founded the Red Cross? - it wasn't Clara Barton.People in Australia celebrate with pies, curry and lamb chops? ?In 1897 Australia wasn't federated so there was no Australian Department of Agriculture. I assume he meant New South Wales. "Developing governments, especially those, like Australia, endowed with money from a foreign crown..." What? What money from a foreign crown? In 1897 NSW and the other colonies were self governing and raised their own revenue.More attention to detail or a good editor would have improved this book. Informative and fascinating. I grew up a mile from David Fairchild’s estate, “In the Woods,” in North Chevy Chase and had not heard of him or the estate. If you enjoy stories of English eccentric explorers then you will enjoy this tale of American plant nerds and eccentrics. 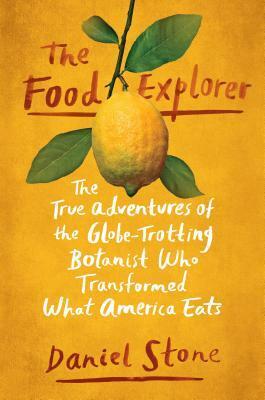 Although the book is about Fairchild and his stewardship of food exploration we meet many interesting characters who deserve books in their own right: foremost among them being Frank Meyer for whom the lemon is named; Barbou Informative and fascinating. I grew up a mile from David Fairchild’s estate, “In the Woods,” in North Chevy Chase and had not heard of him or the estate. If you enjoy stories of English eccentric explorers then you will enjoy this tale of American plant nerds and eccentrics. Although the book is about Fairchild and his stewardship of food exploration we meet many interesting characters who deserve books in their own right: foremost among them being Frank Meyer for whom the lemon is named; Barbour Lathrop, a millionaire who accompanied Fairchild and bankrolled Fairchild’s expeditions in a unique private citizen/government relationship; James Wilson, Secretary of Agriculture for 16 years through four presidents; and Charles Marlatt, a government entomologist and friend of Fairchild turned nemesis.Chapter 19’s title could describe current events- “Sad and Mad and So Utterly Unnecessary.” Fairchild had transformed the Department of Agriculture with his collection of food/plant species. The US penchant for leading the world and being the best included agriculture and plant imperialism was the strategy. The US embraced the world but it also began to embrace xenophobia. Much like the exclusion of Asian immigrants it turned inward with fear of invasive insects which could destroy all the crops we had “stolen” from the world. This unwarranted hysteria and fear campaign was led by Marlatt, another government scientist. It led to legislation which quarantined Fairchild and his team’s shipments.It’s sad in this age of the foodie we don’t know more about these pioneers in food exploration. We owe so much to them. This book was almost everything I look for in narrative nonfiction. The author took an off-beat topic and turned it into a good story. I enjoyed reading it and learning about a new-to-me part of history. My only complaint is that it didn’t have any particularly exciting or memorable moments. I never felt Fairchild was in danger. There was no adventure or suspense. There also could have been more exciting fun facts. The only one that stuck with me is that ‘wasabi’ in the US is almost always actua This book was almost everything I look for in narrative nonfiction. The author took an off-beat topic and turned it into a good story. I enjoyed reading it and learning about a new-to-me part of history. My only complaint is that it didn’t have any particularly exciting or memorable moments. I never felt Fairchild was in danger. There was no adventure or suspense. There also could have been more exciting fun facts. The only one that stuck with me is that ‘wasabi’ in the US is almost always actually dyed horseradish. As with many other books, I feel like even a small flaw can take a lot of time to dissect. Even without high adventure, this was an interesting story and one I’d recommend. It just wasn’t such a stand out I’m going to push it on you 🙂This review first published at Doing Dewey. Maybe 3.5 stars for this one. I enjoyed expanding my understanding of the expansion of food in the United States. That may seem like a boring topic, but Stone makes it quite interesting. I doubt I will ever look at my lemons or avocados quite the same way again. I’m also now curious about all those foods that did not become staples of our diet (would someone please find that personal-sized pineapple with hardly any core?). Then there is the fascinating topic of the battle between those who champ Maybe 3.5 stars for this one. I enjoyed expanding my understanding of the expansion of food in the United States. That may seem like a boring topic, but Stone makes it quite interesting. I doubt I will ever look at my lemons or avocados quite the same way again. I’m also now curious about all those foods that did not become staples of our diet (would someone please find that personal-sized pineapple with hardly any core?). Then there is the fascinating topic of the battle between those who championed “plant immigrants” (Fairchild) and those who saw them as conveyers of invasive bugs and disease (Marlatt). My disappointment with this book is that it is not particularly inspiring, although it is definitely interesting. I never felt like I got a really good understanding of David Fairchild’s personality, either. However, I’m glad I read it. I know this is probably considered a science/food book but it's really a pretty amazing adventure story with the side benefit of giving the US some of it's most loved (and hated) produce: cashews, mangoes, avocados, dates, kale, nectarines, Meyer lemons, to name a few, plus flowering cherries including those in Washington, DC. While 3/4 of the book focuses on David Fairchild and Barbour Lathrop, the last quarter also gives due to several other key players and their contributions: Frank Meyer (le I know this is probably considered a science/food book but it's really a pretty amazing adventure story with the side benefit of giving the US some of it's most loved (and hated) produce: cashews, mangoes, avocados, dates, kale, nectarines, Meyer lemons, to name a few, plus flowering cherries including those in Washington, DC. While 3/4 of the book focuses on David Fairchild and Barbour Lathrop, the last quarter also gives due to several other key players and their contributions: Frank Meyer (lemons), Charles Marlatt (responsible for inspection and quarantine of imported plant material), and Wilson Popenoe (avocados). There is no doubt it is a dense book (you'll need more than a couple sittings) but it does not drag. The tone is conversational and the story reads like a detailed novel not a fact-stacked history textbook. I think anyone interested in food/food systems/plant selection and/or travelogues will find this of interest. I had visited the Fairchild Botanic Gardens in Miami, but I had not idea about its rich heritage. David Fairchild was a renowned scientist who travelled the globe looking for edible flora to bring to the U.S. At one point in the book the author mentions how he can't help but see the fruit (no pun intended) of Fairchild's labor every time he eats a meal. I have found myself doing the same recently. A remarkable book, worthy of this remarkable man. I’m quite jealous of Fairchild, as he got to explore the world before globalization and got to see cultures original and intact. Globalization has killed a lot of things. Very interesting book and adds a new perspective to some American history. Purchased a Meyer lemon yesterday and said a thanks to Frank. Part of what made this a good read is that Fairchild wrote down details of his travels that were relayed in the book and the photos add a nice touch. Way too loosey goosey with the facts (I think in an attempt to be poetic) to be reliable. I read the occasional non-fiction book but after picking up and absolutely adoring The Food Explorer by Daniel Stone, I've decided it's a genre I'll be reaching for way more often. When I'm not reading, I'm actually a plant biologist, but I think this biography of David Fairchild, a food explorer who traveled the world and introduced crops like avocados, mangoes and seedless grapes, to America, is an excellent read no matter your day job. Stone includes just the right level of detail to be infor I read the occasional non-fiction book but after picking up and absolutely adoring The Food Explorer by Daniel Stone, I've decided it's a genre I'll be reaching for way more often. When I'm not reading, I'm actually a plant biologist, but I think this biography of David Fairchild, a food explorer who traveled the world and introduced crops like avocados, mangoes and seedless grapes, to America, is an excellent read no matter your day job. Stone includes just the right level of detail to be informative but not dry, and the stories of Fairchild's adventures would be unbelievable if they weren't true.Even having studied plants for years, I learned a lot reading The Food Explorer. I listened to half the book on audiobook before it expired and Stone does an excellent job with the narration. I actually purchased a copy of this book for a plant breeder I know the day after finishing it, so that's how much I loved it. I rarely re-read books but The Food Explorer is definitely one I plan to revisit because there are such interesting anecdotes and history. This is such just a great, engaging, and informative book, I already know it'll be making it onto my favourites list for 2018. Meals must have been pretty dull in the nineteenth century. My high-school history class made a big deal of the scenes where Native Americans introduced European settlers to maize, but no one told us how many foods we take for granted today were not found in North America until someone began importing them for farmers to grow locally. Without major efforts to introduce them to American farms we would not have items like asparagus, bananas, or even apples and onions.The Food Explorer tells the ad Meals must have been pretty dull in the nineteenth century. My high-school history class made a big deal of the scenes where Native Americans introduced European settlers to maize, but no one told us how many foods we take for granted today were not found in North America until someone began importing them for farmers to grow locally. Without major efforts to introduce them to American farms we would not have items like asparagus, bananas, or even apples and onions.The Food Explorer tells the adventures of David Fairchild, who traveled the globe numerous times beginning in 1894 searching for new or improved plants to benefit American farmers and consumers. And they WERE adventures. Beyond the obvious perils of world travel at that period, including disease (Fairchild’s companion Lathrop caught yellow fever on one of their trips. ), not all countries were eager to lose a possible competitive advantage by having their local crops grown by American farmers. Sometimes Fairchild was essentially engaged in espionage and had to smuggle his finds back to the United States.Fairchild’s quest to broaden the scope of American agriculture was a personal one, but, not being a wealthy man, he needed sponsorship. During many of his trips he was sponsored by or was an employee of the US Department of Agriculture, but as political winds shifted, so did their interest, and Fairchild’s funding waxed and waned. In one episode the Secretary of Agriculture sent him to Corsica and then after he arrived refused to send him the money to do the job! Fortunately Fairchild had a benefactor in the person of Barbour Lathrop, a highly idiosyncratic character with a love of travel and a need for companionship and whose deep pockets helped compensate for his testy personality.In addition to Fairchild’s story, there is a lot of interesting lore in the book, such as how to solve the challenge of getting collected specimens back to Washington safely, e.g., by sticking cuttings into the starchy centers of potatoes. I also learned that, although the tomato is a biologically a fruit, the Supreme Court in 1893 declared them to be a vegetable in order to collect higher tariffs on them. And if you enjoy eating French fries, thank Thomas Jefferson, who first served them in the White House in 1799.Although Fairchild is definitely the hero of the book, there is plenty of background to provide the context in which he was able to do his work. New big companies in the late nineteenth century such as Kellogg’s introduced exciting products like chocolate milk and whetted the American appetite for other new foods, and events like the Chicago World’s Fair of 1893 introduced more than just the Ferris wheel. The importance of agriculture to the economy made agricultural policies even more of a political football than it is today, and congressman would distribute largesse in the form of seeds.David Fairchild was not the only zealous food explorer who opened America to the broader world of food, but his story is an inspiring example of what one man can do with determination, grit, and some serendipity. It is a fascinating read.NOTE: My thanks to the publishers and Netgalley for an advance review copy of this book. I enjoy the story of David Fairchild a lot and the author was able to describe his life and epic travels in a very interesting way. More an adventure book than a biography, Highly recomendable. La storia del botanico David Fairchild mi é piaciuta parecchio e l'aútore é stato in grado di descrivere la sua vita e i suoi viaggi complicatissimi (ai tempi) in modo da scrivere piú un libro di avventure che una biografia. Da leggere!THANKS TO EDELWEISS FOR THE ARC!